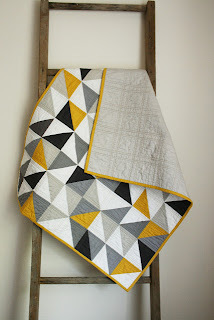 I have noticed an influx of randomized half square triangle quilts made with solid fabric. 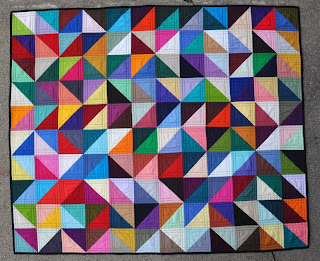 I'm loving this one from A Quilter's Table. What makes this work? For starters, the color scheme is lovely. 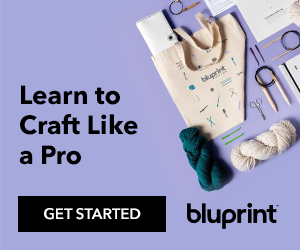 If you need a bit of inspiration to get you started, check out Design Seeds for daily palates of color that are sure to get you in a vivid mood. Next, you have to know how to make all those versatile HSTs (half square triangles in quilty lingo). Decide how big you want each HST to be. Add 7/8 of an inch to the finished size (the size it appears to be in the quilt when it is completely put together, seam allowance not included) if you refuse to square up (cut it to exact size) afterwards. However, I recommend that you add an entire inch and plan to cut your HSTs down to the exact size (finished size plus 1/2") later to remove the margin of error that comes from not-totally perfect 1/4" seams and slightly overzealous fabric handling during pressing. Cut two diferently colored squares at this measurement. 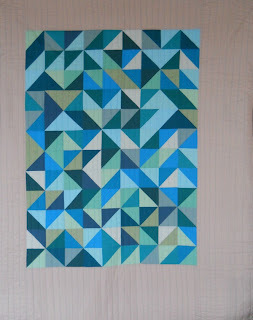 The result will be two identical HSTs. Draw a line on the diagonal of the wrong side of one of the squares, from corner to corner. 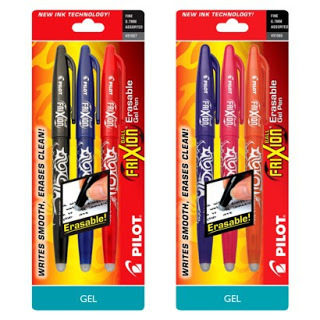 You can use pencil, any marking instrument, or a Frixion pen. Yea, that's right, I just mentioned the TOOLS! 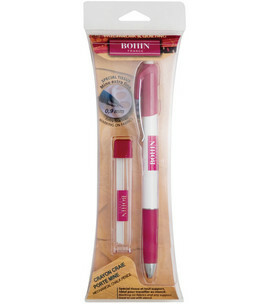 Yes, you could use pencil, but you wouldn't have near as much fun as if you used this handy, dandy Bohin marking pencil available here or here. It's especially great on deep, dark fabrics. 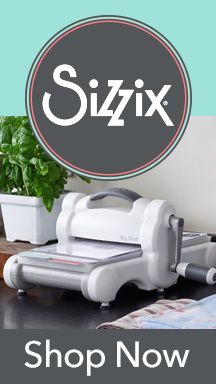 I'm also a fan of these guys, because, you have to admit, there's just something awesome about disappearing ink. 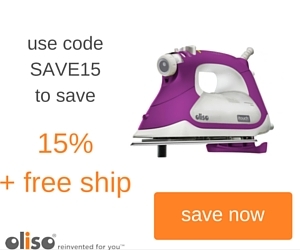 When you heat this ink with an iron, it goes away. You can erase it too, but that doesn't quite have the same magic factor. 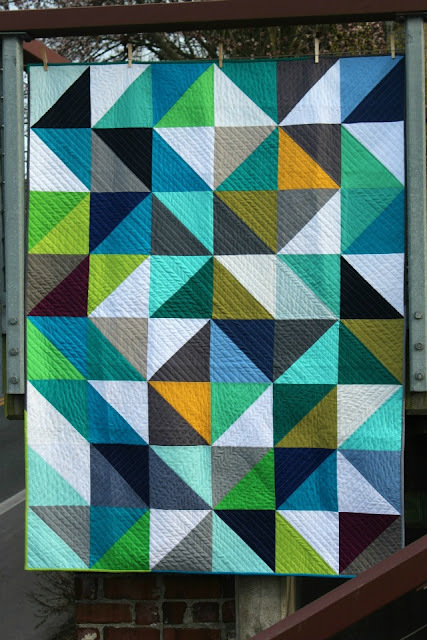 Disclaimer: If you make quilting lines with it, it looks a little shinier where the line was marked, even after you heat it. That said, I love them anyway. You can buy these babies at Target. 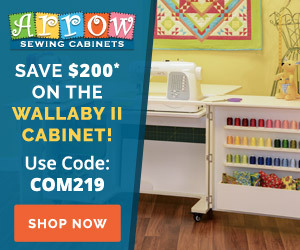 Please don't let the quilt shops know I told you this! Sew 1/4" from either side of the drawn line, not on the drawn line. If you are making heap loads of these, do the left side of the line on all of them without clipping the thread between each. 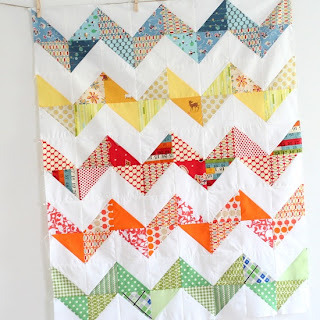 Then, take the entire string of them, flip it around, and sew on the other side of the line. This is called "chain stitching" and will save you a lot of time. 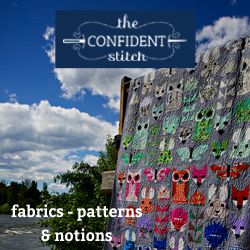 Once you're done stitching, press toward the dark fabric. This means the part you don't see because it is now in the seam will lay underneath the dark fabric if you have pressed it correctly. Cut on the drawn line once you have finished pressing. You will have two HSTs. 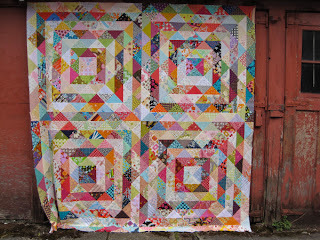 If you cut your blocks 1" larger instead of 7/8" larger, now is the time to cut them down to size. I do this using another of my favorite tools, a small square ruler. Which ruler to use will depend on your HST size. Just make sure the ruler is the same size or larger than your unfinished block size. Here I am using a 4" square ruler to cut 2 1/2" unfinished HSTs. I line up the diagonal line of the ruler with the diagonal line of my block and cut off as little as possible on the right and top sides. I rotate the mat if it is small enough, or the HST if the mat is too large. 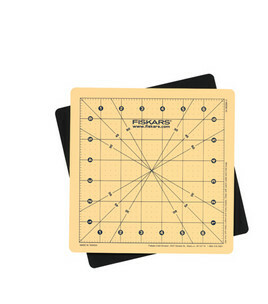 This brings me to another great tool--a rotating cutting mat such as this Fiskars one. Then cut the remaining two sides to your unfinished size. If you'd like another perspective on the subject, Coopcrafts has a great tutorial here. Once you have made your HSTs, lay them out however you like and sew them together. 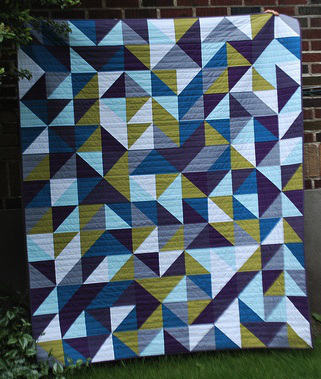 E-mail me your quilt at aftonwarrick@hotmail.com, and I'll add it to this post. Katie of Sew Katie Did made this similar quilt. 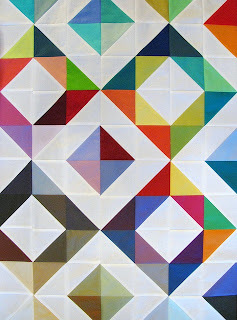 I enjoy this color scheme from the Boston Modern Quilt Guild's blog. 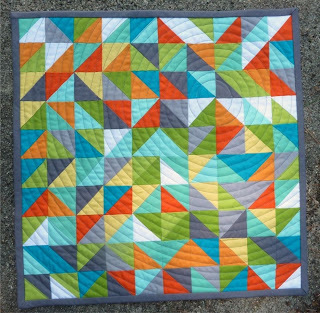 The circular quilting is great too. 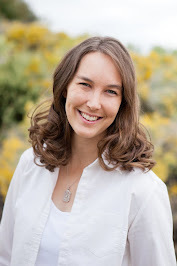 Here is Erica of Craftyblossom's take on the theme. More examples are shown here. Sara Cooper on CoopCrafts made this quilt featuring HSTs in a more structured layout. 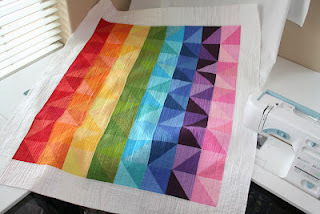 Emily Herrick of Crazy Old Ladies made this rainbow version.